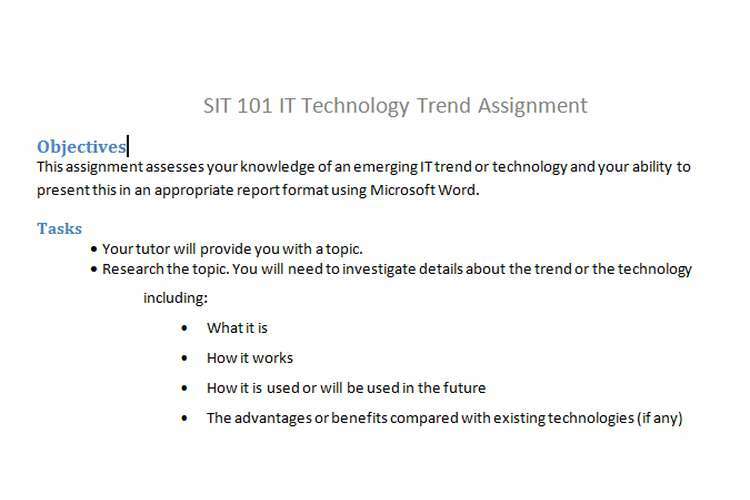 This IT Technology Trend Assignment assesses your knowledge of an emerging IT trend or technology and your ability to present this in an appropriate report format using Microsoft Word. Your tutor will provide you with a topic. You will need to research a number of sources to obtain the relevant information. At least four of these sources should be used for your report. The resources must be credible, current (no earlier than 2013) and available in English from a number of different sources. Do not use Wikipedia, blogs or any form of social media. Produce a written article of about 1500 words (not including the words in the References section) using Microsoft Word. Consider the readers of your report to be first-year students, so do not make your report too technical. The report must be carefully spell checked and proofread. A Table of Contents is not required. The report must be written in the third person. A title page with the topic name and your details, with no header or footer. The word count of your assignment, excluding references, should be included at the bottom of this title page. A second page with an Executive Summary of your report. Headings such as Introduction, Conclusion and References with content as per Task 2, starting at Page 1. The headings should not be numbered. A header with the name of your topic on the right-hand side. A footer with your student id on the left-hand side and the page number aligned right. A minimum of two styles - one for headings and one for the content (body) and used throughout the report. These styles should be named first name-heading and first name-body, where first name is your name Eg john-heading; john-body. A footnote with appropriate text. Two graphics from your sources i.e. not Google images, with referencing. Columns where appropriate within the report. The list of the references you have used, presented correctly, in Harvard style. Do not just copy and paste text from a book or website. This is plagiarism and you unlikely to achieve a pass for the assignment. You should summarise what was said in your own words i.e. paraphrase and then indicate that it is a citation EG. The first instance of this information technology appeared in 2001 (Barton 2014). If you use text directly from a source then you must use quotation marks and give the page number in the citation. EG. ‘The first instance of this technology was in 2001 when it was used by the USA military’ (Barton 2013, p1). Every citation that you use must have full details about the source in the References section at the back of the report. There are strict rules about citations and referencing. For this assignment you should use Harvard Style. Information about good assignment writing and referencing can be found on the Deakin University website at http://www.deakin.edu.au/students/study-support/referencing . There is a booklet about Harvard style which you should download and/or print off and use for your assignment. the correct use of appropriate features of Microsoft Word.